Brochure design is a perennial in the world of marketing and graphic design, yet it can be challenging to execute successfully. New in paperback, this collection of the world’s best brochure design offers hundreds of ideas, pages of inspiration, and armloads of advice for professional graphic designers and students alike. 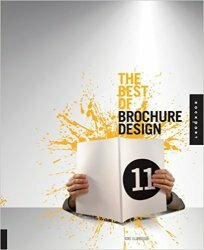 Using a clean, unfussy presentation, The Best of Brochure Design 11 is a highly visual collection of ideas for everything from choosing type to photo treatments, and everything in between.